What is it? – Swordless Ninja is an action-adventure game where you play a young ninja named Mabushi, whose girlfriend Miyuki has been stolen by the evil Gorbazaki, along with his trusty sword. It’s your job to dish out swordless revenge and rescue the maiden. Who made it? – The game was developed by Berzerk Studio. How does it play? 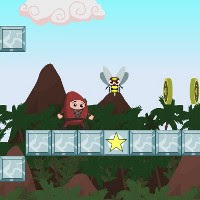 – Swordless Ninja is a fast-paced, quirky platformer, presented in the same spirit as early Mario games. Your ultimate goal for each level is to make it to the exit portal, but along the way, you’ll collect coins, blueberries, and power-ups, and do battle with a bunch of strange creatures, including bees, frogs with boxing gloves, and Venus Fly-Traps. Some enemies can be dispatched by jumping on their heads, and then hurled at other enemies to take them down. Bad-guys like jumping plants and spiky-backed dinosaur creatures will damage Mabushi if he jumps on them. However, a shuriken collectible allows you to chuck throwing stars and absorb an extra hit of damage (very similar to Mario’s Fire-Flower power-up). Presentation – The visuals and sound effects are colorful and sharp, bordering on cloyingly cute. Mabushi is an instantly endearing protagonist (reminiscent of another Flash ninja named Bowja), and while the core story of rescuing a kidnapped girlfriend isn’t remotely original, playing as a ninja without his trusty sword makes the game feel fresh. Positives – The game is quite fun, and there are quite a few levels to complete. Completionists will also rejoice at the number of optional collectibles there are, and it’s pretty difficult not to find the experience to be a charming one. The game is also a lot more challenging than it looks. Negatives – The action is fast, though it felt as though the framerate suffered a bit. It seemed as though the camera (always focused on the ninja), wasn’t quite smooth enough, lending an occasional herky-jerky aspect to the action. This issue was really only annoying when I was trying to make a very precise jump (or series of them), or scramble over a ledge. On that note, Mabushi can be taken out by one hit from an enemy (or two, if he’s powered-up), which may frustrate more casual players. Why you should play it – Swordless Ninja is a high-quality title with a lot of personality that’s quite fun to play, despite some very minor technical issues. There are certainly worse ways to kill some time, especially if you ever want your sword and girlfriend back.